We are half way through 2016…. already. I must have blinked a little too long. Now is a good time to see what marketing trends are playing out and what others are emerging for 2017. 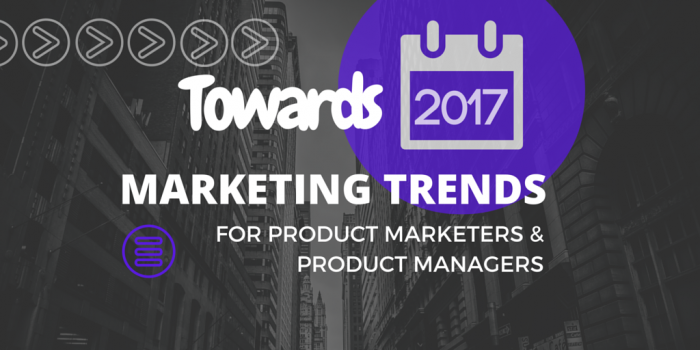 Product Marketers and Product Managers that have marketing responsibilities need to stay in tune with emerging trends. Go to market execution is a core competency. Do it well and it is a competitive advantage. So, let’s review what new trends and technology are emerging to help you sustain that competitive edge. The backbone of this blog is written around a recent report from Hubspot called The Future of Marketing: What will marketing look like in 2017? It was authored by Erik Devaney. Data Driven: if you are not yet measuring your marketing efforts and investments then get ready to do so soon. You need to ensure you are able to measure your efforts so you can do more of what works well and less of what doesn’t. There are too many marketing channels today that can burn up your marketing free funds and time before you can say ABRACADABRA. Experiment, gather data, measure, refine. Personalised: this topic has been discussed extensively for the last three years. Nothing too new here. But, a timely reminder to approach personalisation correctly. Integrated: although this point in the report is really just a big promo for Hubspot’s integrated marketing automation platform, it is still quite valid. I have used disparate systems and I have used an integrated marketing system like Hubspot. It is DEFINITELY a lot easier if you can plan your communications and content in one place. One place to gather data, one place to measure and grow. If you can manage all of your online marketing concerns in one location it makes it easier to balance with your offline activities as well. Native: traditional marketing concepts centre on ‘interrupting’ someone; getting them to pay attention at a time that suites you. These days that is not so effective. Your buyer is busy?—?they have developed a filter on marketing interruptions. They haven’t got the time or patience to deal with your product-centric jibber jabber. Instead, focus more of your marketing efforts to guide your buyer along their journey of problem solving, at a time that suits them. Permission marketing, an evolved approach from Interruption Marketing proposes to reposition your marketing efforts to a time and place that helps your buyer when they need help. This could be an article/ebook that educates the buyer but positions a solution in context. Mobile (& Beyond): This topic has been done to death I think, ever since Google started scoring websites by their mobile friendliness around April 2015 https://developers.google.com/webmasters/mobile-sites/. There are several ways to make your website mobile friendly. However, the most effective way, that reduces ongoing content maintenance and adapts to future device changes, is responsive design. In summary, your website should be easy to use and look good, regardless of the device being used to view it. So, the Future of Marketing report is a nice summary for Product Marketers to focus on the right priorities. However, there is one key thing missing from it. There is a massive technology trend in marketing that is in play now and really should be on the minds of anyone responsible for taking products to market?—?Advocacy Marketing, or sometimes called Referral Marketing. The concept is as old as the hills?—?happy, engaged customers are one of the best sources of new customers. Why? Because they tell friends, family, colleagues of their great experience. A referral benefits everyone. The supplier gets a new customer, the new customer feels more confident in the value they will get because someone they trust has vouched for it and the existing customer gets that warm-glow feeling. But, this source of new customers is too valuable to leave to chance. Product Marketers should consider things they can do now to drive referrals, foster greater advocacy and build a pipeline of new business from engaged customers. Thus, advocacy marketing solutions are now becoming popular?—?to drive advocacy and the pipeline that can come from it. Fostering customer advocacy is part of the Buyers Journey. For more insight into advocacy/referral marketing, check out the infographic at the end of this post. Many of these concepts are now modern day essentials for Product Marketers and Product Managers that need to market. The marketing arena is changing very quickly?—?faster now than in the previous 50 years. To guide Australian product professionals through these waters Brainmates offers a dedicated, 2-day ‘Essentials of Product Marketing’ course. It is delivered face to face and fosters group participation across the main concerns of taking products to market and keeping them competitive for as long as they can be. You can find out more details on this product marketing course here as well when it is next scheduled. [INFOGRAPHIC] What is Referral Marketing? The infographic here explains the value of a managed referral marketing program. Thanks to the team at ReferralCandy for putting it together.